Jaared Arosemena was born January 20, 1967 at Washington Hospital Center in Washington DC. Jaared grew up and went to school in Bedford, VA. He started playing saxophone at age 7 while he was still in elementary school. One of his initial inspirations to play the sax was David Sanborn. He says, "Once I heard Dave play, I knew right then and there that the saxophone was my calling! I can't possibly think of my life without my music. I need it like I need water or air." Over the years, time would see Jaared become an all-county, all-state, and all-national player before he would reach his 18th birthday. In Jaared's senior year of high school, (Liberty High School, Bedford VA.), Jaared was awarded a great honor. He was chosen as 1 of only 100 highschool students nationwide to tour in Europe in 1985. He toured eight countries in a little over 30 days. Some of the countries included Sweeden, France, Italy, Austria, Germany, and England. After his European tour, he then moved back to his birthplace of Washington, DC and immediately started playing live concerts and doing his fair share of studio work in the DC area. Since 1985, Jaared has come to be one of the most "in demand" performers around and has also been consistently named as one of the top three saxophonists in the Greater Washington, DC Metro area. 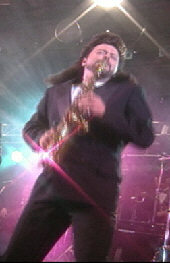 Jaared has toured with Maysa, (female vocalist with Incognito), and contemporary jazz group "Grainger". Jaared is now writing new material for his first solo CD. Talent scheduled to appear on the CD include Bobby Caldwell, Gary Grainger, Dennis Chambers, and Scott Ambush, just to name a few!